Channel 4 will become the first mainstream UK channel to broadcast the Muslim Call to Prayer live every morning during the month-long festival of Ramadan. Manchester’s Corporation Pop has been commissioned to produce the online assets to support the 4Ramadan season. This includes a bespoke website, with a countdown to the Calls to Prayer, a sentiment gauge in the form of a Twitter word cloud and an infographic with the “do’s and don’ts” for Muslims during Ramadan. The “sentiment gauge” is operated by users Tweeting a word along with the hashtag #RamadanMeans and then the most popular words are displayed against a background of a moon, to illustrate the current stage of the moon cycle. Overlaying the Tweets is the word “Ramadan”, written in Arabic calligraphy by Ruh Al-Alam from agency, Make Me Believe. “This was a real opportunity for us to understand more about what it means to be a British Muslim. It was also great to collaborate with Ruh at Make Me Believe who produced the calligraphy and gave us valuable input on our initial design ideas. I’m really please with the final results and I’m particularly looking forward to watching the Sentiment Gauger evolve over the course of the month,” said Dom Raban, managing director at Corporation Pop. Raban’s agency conducted a series of user-tests with British Muslims before finalising the designs. “We hope the website inspires Muslims in the UK throughout the month of Ramadan and beyond, particularly during those very early hours before the first call to prayer, enabling them to focus on what Ramadan means to them personally and to share their thoughts. The online content seeks also to capture the imagination of other Channel 4 viewers keen to learn more about the Ramadan experience,” added Lizzy Keene, senior online producer at Channel 4. Channel 4’s in-house design operation, 4 Creative, will use the graphics to create on-air branding. 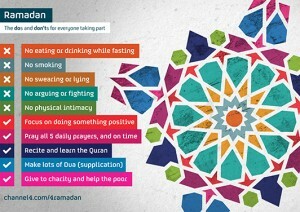 The season of programmes starts on Monday 8th July with A Very British Ramadan.